Perricone MD presents the Thio Plex Intensive 2-Step Brightening System; an innovative, multi-tasking two-part treatment that utilises advanced ingredients with exceptional potency to deliver superior brightening and anti-ageing results. Step one, Intensive Base, contains an unprecedented concentration of Thio Antioxidant, the body’s natural detoxification agent, to help repair and replenish damaged cells for a firming effect. Step two, the Brightening Activator, delivers ultra-high levels of a proprietary Vitamin Complex, harnessing the age-defying properties of Vitamin C Ester. The duo of treatments work synergistically to transform dull and ageing skin, helping to minimise the look of discolouration and unveil a more even, refined tone. Skin feels nourished and revitalised with a healthy-looking radiance. 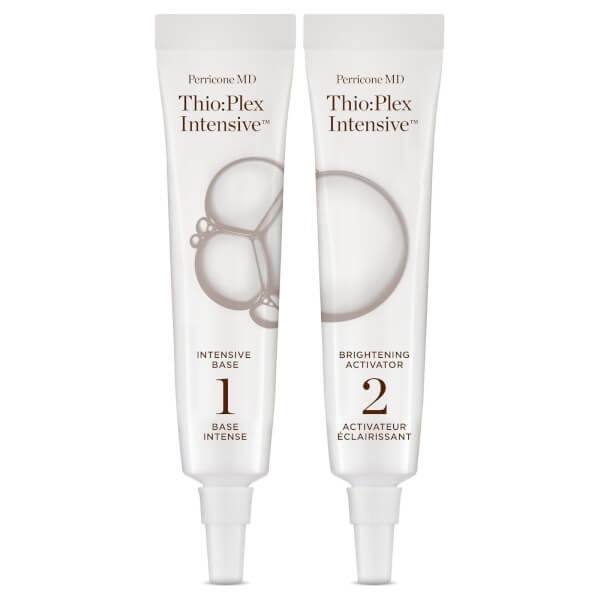 In the evening, Dr. Perricone recommends applying a pea-sized amount of Step 1 – Intensive Base onto a cleansed face. Wait a few moments until product is completely dry and layer with a pea-sized amount of Step 2 – Brightening Activator. Leave on for up to 20 minutes and rinse with water. Apply once per day in the evening. For additional benefits, reapply both steps on particularly noticeable areas of discoloration as a spot treatment. May also be left on overnight. Intensive Base: Water/Aqua/Eau, Glutathione, Kaolin, Magnesium, Aluminum Silcate, Aluminum Chlorohydrate, Disodium EDTA, Fragrance/Parfum, Glyceryl Stearate, Alcohol Denat., Dimethyl MEA, Phosphatidylcholine, Thioctic Acid, Ascorbyl Palmitate, Ascorbyl Glucoside, Glycolic Acid, Xanthan Gum, Camellia Sinensis Leaf Extract, Colloidal Silver (Nano), PEG/PPG-18/18 Dimethicone, Caprylyl Glycol, Glycerin, Phenoxyethanol, Sorbic Acid, Limonene. Brightening Activator: Water/Aqua/Eau, Ascorbyl Palmitate, Isoprobyl Palmitate, Cetearyl Alcohol, Glyceryl Stearate, PEG-100 Stearate, Tocotrienols, Tocopherol, Sodium Hyaluronate Disodium EDTA, Ceteareth-20, Dimethicone, Cyclopentasiloxane, Caprylyl Glycol, Cyclohexasiloxane, Zinc Sulfate, Elaeis Guineensis (Palm) Oil, Phenoxyethanol, Sorbic Acid, Fragrance/Parfum, Limonene, Linalool, Citral.